Following on from yesterday’s search success, we thought it would be fitting to offer an insight into how the team operates, and why we perform so well as a team in any given operation. Each team member is trained in a variety of skills from day one, with the basic level of competency to become operational being that of the Search Technician. Upon joining the team as a probationary member, a volunteer will attend a number of specialist training sessions, covering Navigation, First Aid, Basic Life Support, Patient Evacuation, Communications, Search Techniques, Fitness and an overview of operations. Following the initial training the volunteer will then attend a two day course for further training and assessment, and upon successful completion will gain the qualification of Search Technician, and with one final team assessment, an operational member of the team who can attend callouts. Alongside the training sessions, all of our team members assist with fund raising activities, which range from bucket collections at venues throughout Shropshire, Herefordshire and Worcestershire, open days, event support and community fund raisers. It’s worth noting that during this initial training period (and indeed, throughout their time as a search volunteer), our probationary members will be paying for their own fuel costs and personal equipment, as well as for their assessment course. The team covers training costs such as fuel for WMSAR vehicles, venues and any team kit. Once a member is qualified as a Search Technician, there are many further training courses available, and many members specialise in particular areas whilst keeping up to date with their base competencies – we have our SRTs (Swift Water & Flood Rescue Technician) and FRBOs (Flood Rescue Boat Operator) who man our search boats and are qualified to work in difficult areas involving water; our Quad Bike Team who are specially trained to utilise Quads as a search tool, covering far more ground in a shorter space of time than a foot team can; our first aiders – while all members are trained to a basic level of first aid, we also have advanced courses and highly experienced members who can offer a far greater knowledge and expertise in casualty care; our Team Leaders – experienced search professionals who ensure their team searches a given area efficiently and effectively. Each volunteer brings valuable skills to the team and allows us to develop our overall skill set. We operate under the mantra of CPD (Continuing Professional Development) to ensure we can offer the highest level of care to the vulnerable mission people we search for, and to operate in an efficient and professional way that aids our relationship with West Mercia Police, and the local Fire & Rescue Services. So, on to the search. We can be called out at any time of day or night, 365 days a year – a callout will come from the Police or Fire Services requesting our attendance, and our Search Operations Team spring into action, notifying team members of the search location. Members respond to advise on their availability and as a team, we aim to get all the necessary vehicles and equipment to the Search Location as quickly as possible. At the RV (Rendezvous), the Incident Command Unit (ICU) is set up, and aerial mast erected to allow for team communication via VHF. Our search planners work with the POLSA (Police Search Advisor) to establish the search area and team taskings, dividing the available members into units for deployment. Each unit will comprise of a Team Leader and in most cases two Search Technicians, and once briefed, will move to their target area and begin searching, maintaining communication with the ICU/Search Planner advising of any useful information such as terrain and points of interest. Other tools will also be deployed if suitable for the given search areas, such as the Quad Team. Throughout the period of the search, unites will complete their search areas and return to the RV for debriefing and reassignment to a new area, as well as much needed refreshment and welfare breaks. The Search Planners work to tried and tested methods and statistics to place each unit to cover as much of the search area as possible efficiently, and throughout the search will respond to new information from the ground units and from the POLSA, updating the search units as required. The best result is of course the successful find of our missing person… at worst, we can confidently advise The Police or Fire Service that we have covered a given search area allowing them to focus on other areas. 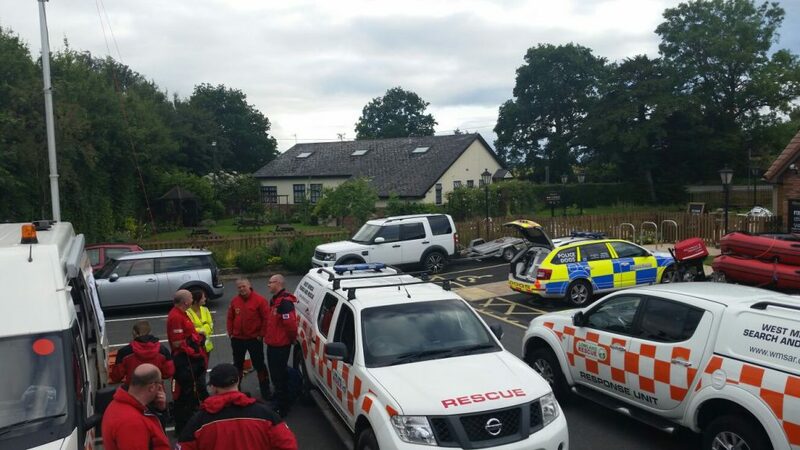 In addition to all of the training and exercises, we are focused on research into how effective different search methods are – in fact it was our specific research into the use of Quad Bikes that has brought us a number of successful outcomes to searches. Pitted against foot searchers and mountain bikes, the quads proved most effective over a set distance, and so plans were put in place to utilise them more on live searches, and they are now a valuable asset to the team. We continue to look into other areas for future development, including the use of air scenting dogs, mountain bikes and many more interesting avenues.